World Taekwondo, the International Amputee and Wheelchair Sports Federation (IWAS), and the International Paralympic Committee (IPC) are all marking 3 December in their own way. VILA REAL DE SANTO ANTONIO, PORTUGUAL – World Taekwondo (WT) joins IWAS in marking the UN’s Day for Persons with Disabilities this year at the IWAS Games in Vila Real de Santo Antonio, Portugal. “We try to do something every year to mark 3 December”, IWAS CEO Charmaine Hooper told WT. “The UN Day played a small role in selecting the timing.” She noted that IWAS also opened their UK office on 3 December 2015. 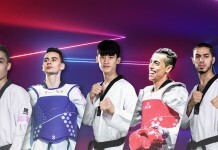 Eighty-four athletes registered for the Para taekwondo event held at the IWAS Games, a biennial multi-sport event featuring hundreds of Para athletes. As a G6 tournament, fighters can earn more points than at any other event on the calendar except the world championships. The IPC is marking 3 December by globally launching their I’mPOSSIBLE youth education programme. First introduced earlier this year in Japan as a buildup to the 2020 Paralympics in Tokyo, I’mPOSSIBLE aims to spread the values of the Paralympic movement to youth around the world. “Through Para sport and Paralympic values, I’mPOSSIBLE aims to challenge and change the perceptions of how young people perceive people with an impairment, thus bringing about a more inclusive society”, said IPC President Andrew Parsons in a statement. Designed by the Agitos Foundation, the IPC’s development arm, the programme provides easy-to-use lesson plans for teachers of youth aged 6-12. This year’s theme for the UN Day for Persons with Disabilities is “transformation towards sustainable and resilient society for all”, an idea that resonates personally with new IWAS Board President Rudi van den Abbeele. The former Belgian Para athlete met his wife at the Stoke Mandeville Games – the forerunner to both the IWAS Games and the Paralympics. Hooper spoke about how the IWAS Games goes to places that may not have much familiarity with persons with disabilities, such as Bangalore, India and Vila Real de Santo Antonio, Portugal. The UN Day for Persons with Disabilities was first observed in 1992. It aims to promote the rights and well-being of persons with disabilities in all spheres of society and development, and to increase awareness of the situation of persons with disabilities in every aspect of political, social, economic, and cultural life. The 2017 IWAS Games runs from 30 November to 6 December in Vila Real de Santo Antonio, Portugal.